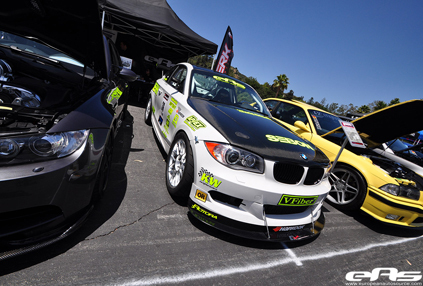 The annual Bimmerfest car meet is widely known as the largest gathering of BMWs in the USA. Normally held in Santa Barbara, Calfornia the event switched venues for 2010 to the famous Rose Bowl Stadium in Pasadena, California. 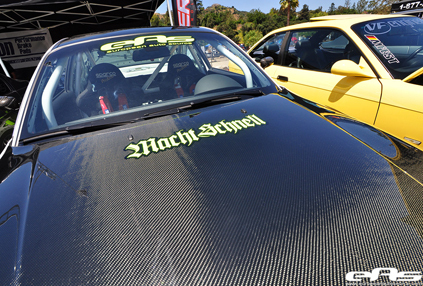 True to form, the Bimmerfest event drew over 2000 BMWs and thousands of spectators driving in from as far away as Alaska and Florida. Not one to miss a party, the Berk Technology Time Attack BMW 135i was on display amongst the sea of Bavarian beauties. 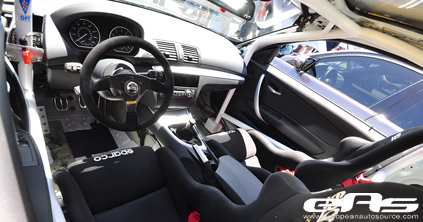 The car was on display in the European Auto Source (EAS) booth which featured a number of crowd pleasing BMW street cars, show cars, and race cars. Spectators and fans of the Berk Technology Time Attack race team got a chance to see our race car live in the flesh and also got to get a sneak peak of some new additions that have gone on the car in preparation for Round #4 of the 2010 Redline Time Attack series coming up in less than a week out at Auto Club Speedway. New additions included a custom carbon fiber rear diffuser and some low-drag Formula GT3 mirrors, both from APR Performance. New custom built KW Suspension Clubsport coilovers were also on the car hidden behind our APEX ARC-8 wheels and Hankook RS-3 tires. 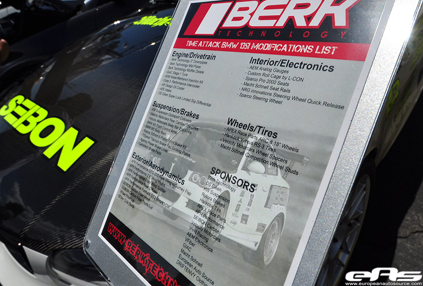 We at Berk Technology were truly overwhelmed with how many fans our time attack car and team have gained this year within the BMW community. Our early successes in time attack competition and the release of our BMW 135i exhaust systems has gained us tremendous support from our fellow BMW owners and enthusiasts. Berk Technology is planning on pushing into the BMW market even harder this year with the release of our new BMW 335i exhaust system, which is currently in the development and testing phase! With the addition of the 335i exhaust system, paired with our already popular 135i exhaust systems and our time attack race team, we plan on quickly becoming one of the most sought after brands in the BMW market! Berk Technology would like to thank European Auto Source and Macht Schnell for inviting us to display our car in their booth. We would also like to thank our time attack race team sponsors for making our car what it is, and of course to all of our fans and customers who make this all worth while for us. This entry was posted on May 25, 2010 at 3:14 pm and is filed under General News. You can follow any responses to this entry through the RSS 2.0 feed. You can leave a response, or trackback from your own site.